2.Small Cap Run Up…..Small Stocks Still Trailing S&P on 3 Year Basis. According to Nili Gilbert and Stuart Kaye, portfolio managers at Matarin Capital Management in Stamford, Conn., small stocks are trading at 10.8 times the cash that their underlying businesses generate from operations, or slightly above their average since 1994. Big companies are valued even more richly, at 11.7 times their operating cash flow, also higher than their average over the past two decades. The gap between those ratios is barely wider than normal, suggesting that small stocks remain relatively cheap even after their explosive rise in November, Ms. Gilbert and Mr. Kaye say. 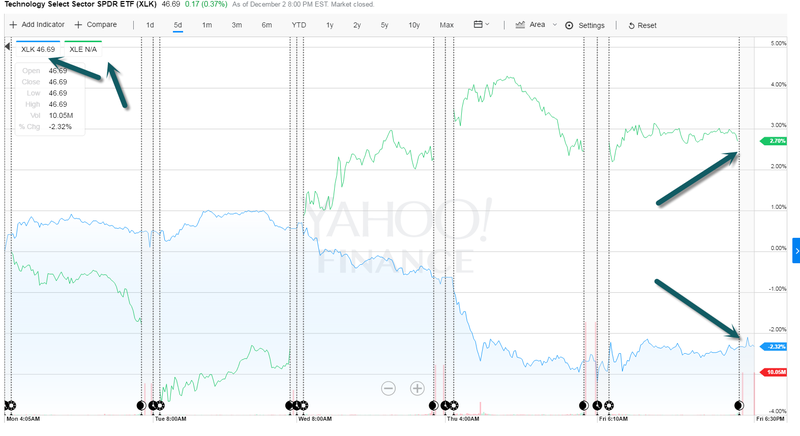 Furthermore, small stocks badly lagged behind their larger brethren in 2014 and 2015. So, even after their torrid performance in November, the returns on both the Russell 2000 and the S&P SmallCap 600 indexes still trail the giants of the S&P 500 over the past three years. 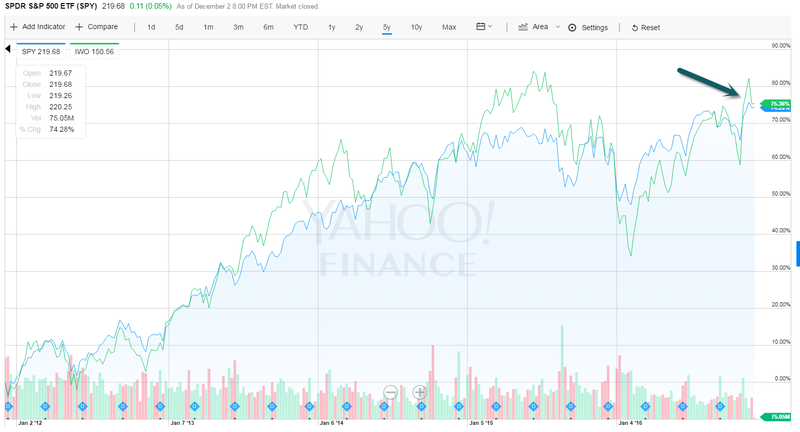 5 Year Comparison S&P vs. IWO (small cap)…Almost Even for 5 Year Period. Italian PM Matteo Renzi’s referendum defeat on Sunday has left Italy facing political and economic uncertainty. Mr Renzi announced he was stepping down after his constitution reform plan was rejected by voters. He met President Sergio Mattarella and will offer him his resignation later. Mr Mattarella must decide whether to appoint a new PM or hold elections. 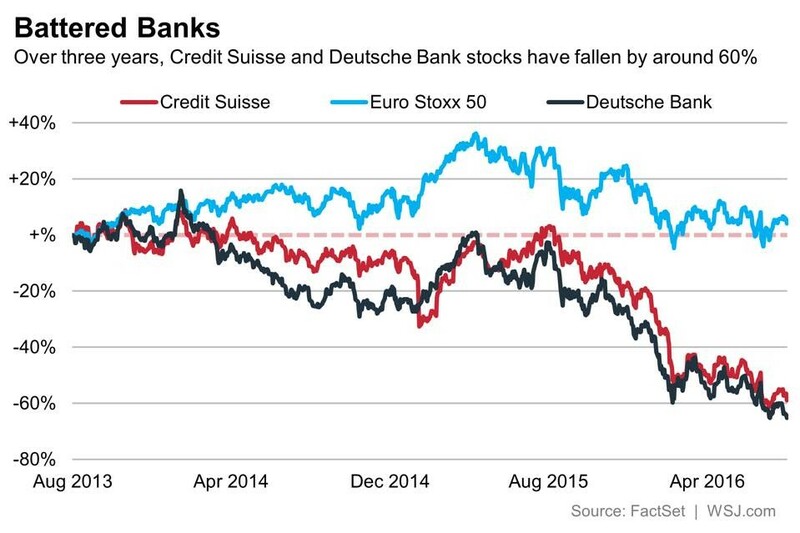 There are concerns the instability may trigger a deeper crisis for Italy’s already vulnerable banking sector. A consortium organizing a possible bailout for one leading bank, Banca Monte dei Paschi di Siena, is meeting on Monday to consider whether to pursue the rescue bid. 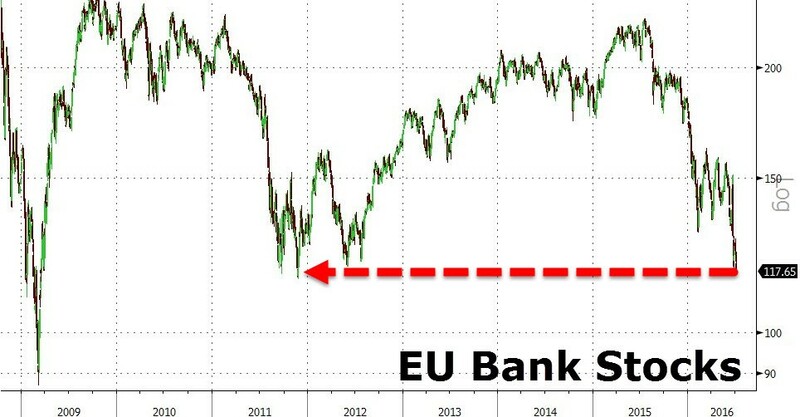 The bank subsector of the Stoxx Europe 600 index is down 19% year to date, and even some of the Continent’s perceived stronger institutions are trading well below tangible book value, the preferred measure for assessing their worth. 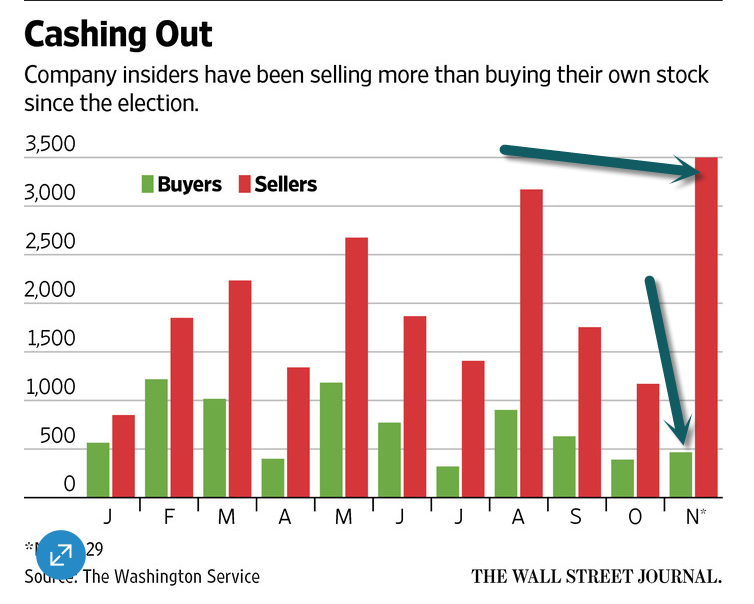 4.Insider Buying and Selling….In November, 3500 Insiders Sold and 467 Bought. A total of 3,500 insiders at Russell 3000 companies have unloaded their own stock in the last three weeks, while 467 purchased shares, according to data from The Washington Service, a Bethesda, Maryland-based provider of insider trading data and news. The number of sellers was higher than the monthly average of 1,832 sellers this year through October. Sellers have also increased from the comparable year-ago period, and buyers have decreased. 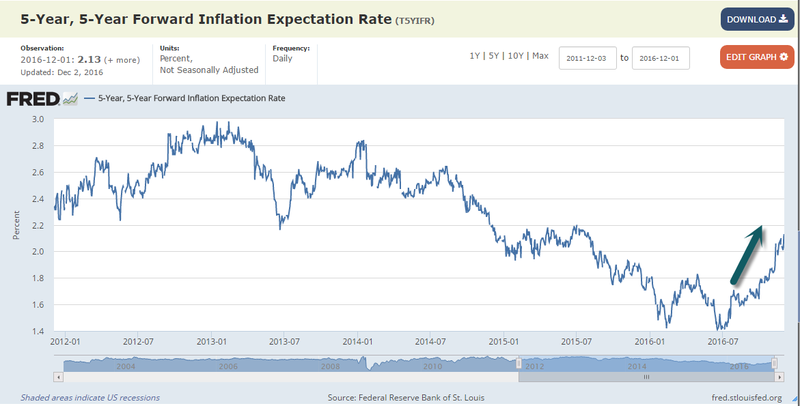 5.5 Year Forward Break Even Inflation Expectations Over 2% for the First Time in 2 Years. 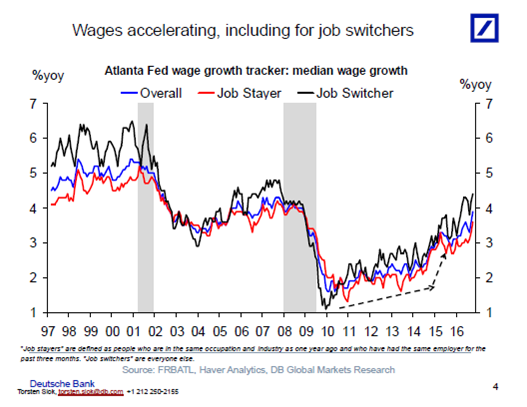 6.Wage Acceleration is Here to Stay…..
Don’t be fooled by the small move down in average hourly earnings growth in November, all measures of wages continue to trend higher, see charts below. 7.Are U.S. stocks cheap, expensive, or fairly valued? Point #1: At 16.8x a projected $131/share in earnings for the S&P 500, U.S. stocks are no one’s idea of “Cheap”. As FactSet points out in this week’s Earnings Insight, this is higher than the 5 year average of 15.0x and the 10 year average of 14.3x. 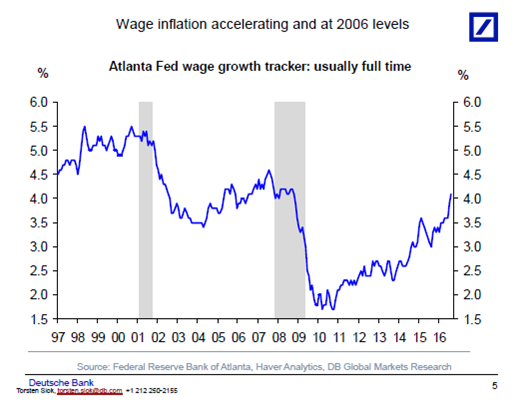 Importantly, that 16.8x comes at a time when interest rates are rising rather than falling (as they generally have over the last 10 years). Higher interest rates lower the present value of future earnings, after all. And that should mean lower valuations. Point #2: Trends in expected 2017 corporate earnings are helping the case for stocks, however. FactSet shows that top-down estimates (those made by strategists rather than single stock analysts) are starting to turn higher in the last few weeks, up about $1/share to that $131/share number we cited in Point #1. Not to encourage you to stop reading, but this is pretty much all you need to know about the current rally in U.S. stocks. Investors are buying in to the notion that a Trump presidency/Republican Congress can move the needle on business and personal tax cuts, infrastructure spending, and reduced regulatory burdens across multiple sectors. 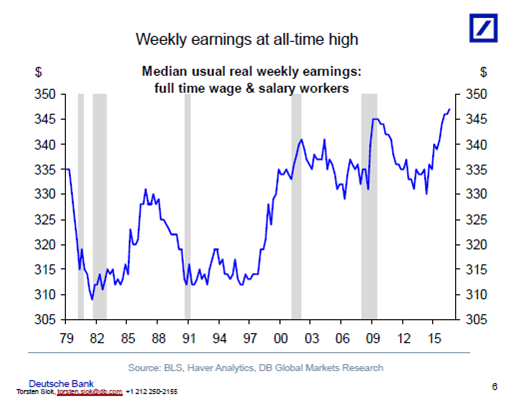 All that adds up to greater earnings power, and that $1/share bump from the Wall Street strategist crowd is a nod to that belief. According to S&P, the companies of the S&P 500 are currently paying out 44.3% of their earnings in dividends. 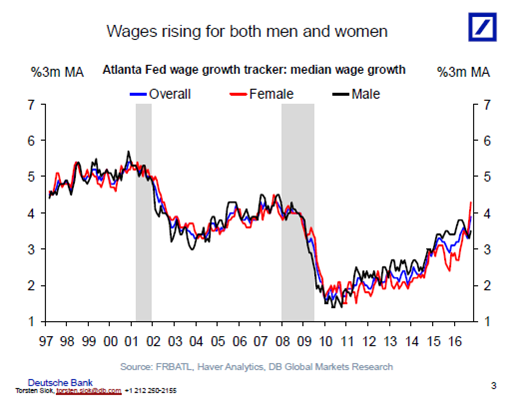 This is much higher than the 38.7% average back to 1988 and more akin to the payouts we see during recessions. 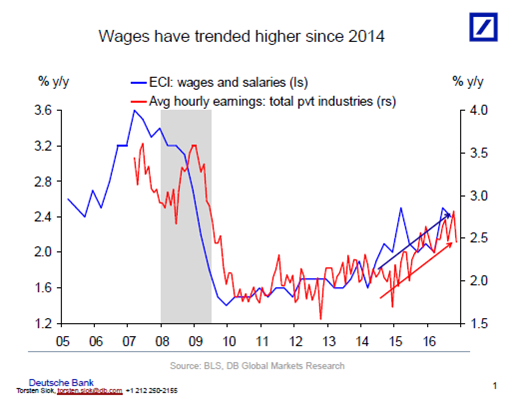 The difference here is that profit margins (currently 10.0% according to S&P) are much closer to cyclical peaks than troughs. For a comparison, consider that payout ratios during the 2006-2007 cyclical peaks were 26-33%. If you want to see the whole time series, shoot us an email and we will send it over. The intersection of earnings growth (Point #2) and stock buybacks/dividends is simple: if the U.S. economy is really going to accelerate in 2017, then public companies will likely choose (at the margin) to reinvest in their businesses rather than hand back cash to shareholders. That’s a big deal for an investor base that has grown accustomed to earnings that end up in their pocket rather than retained by management. Like Veruca Salt, this group tends to want it all. And they want it now. Point #4: The next few quarters are setting up as a cyclical investor’s dream, but like all dreams they require some interpretation. The key sectors to watch are Financials (+9.7% on the year) and Industrials (+17.5% YTD). Both have underperformed the S&P 500 over the last decade, and both have caught a bid since President Elect Trump’s win. The funny thing about cyclical stocks is that investors give them far more leeway than other sectors during an expected upswing. For those of you with graying muzzles, think back to the early 1990s U.S. equity market when auto, airline, industrial and banking stocks had multi-year runs. Markets discounted expected earnings that wouldn’t hit the tape for 4-8 quarters. For those of you accustomed to tech or health care stocks that swoon when they miss earnings by a penny or a dime, this is a whole new kettle of fish. To summarize, let’s remember where we started: valuation, which is the analysis of investor expectations as they relate to asset prices. At first blush, the “Trump rally” feels like it has stretched U.S. valuations beyond reason. The simple math of a 17x PE in a rising rate environment is proof enough of that. The truth is more nuanced, for in reality the whole framework of market expectations has shifted, and rapidly at that. Investors will have to adapt to a world where the companies they own do some investing as well rather than hand back all their earnings in buybacks and dividends. And sectors like Financials and Industrials, long forgotten, may once again show a cyclical resilience out of pace with their near term fundamentals. One thing is for sure: the recent rally is more than just an uptick in asset prices. 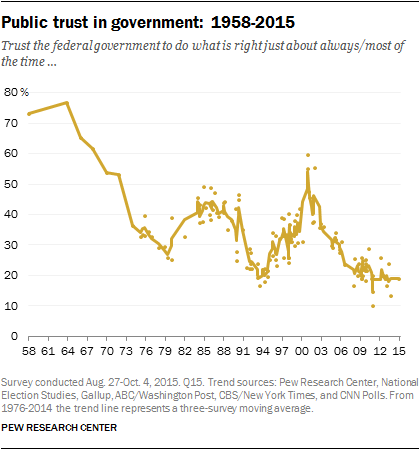 8.Trust in Government was at All-Time Low Going into 2016 Election. 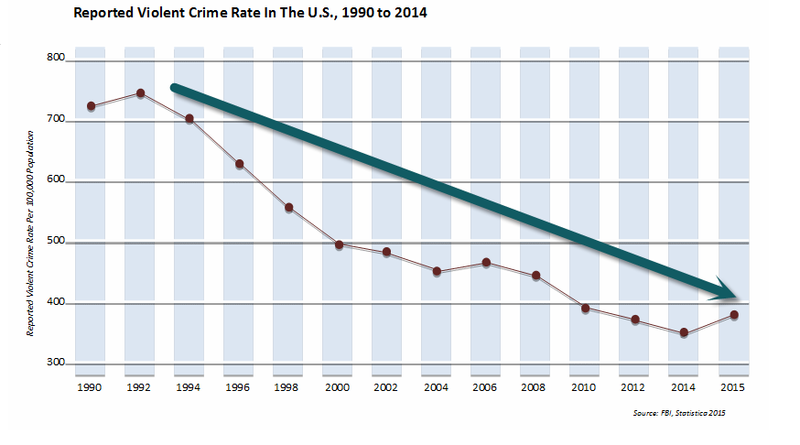 9.Read of Day…Violent Crime Peaked in 1992. The first big issue in Trump’s law enforcement initiative will be his battle with sanctuary cities, something that may set a tone for the administration in the same way that Ronald Reagan set a tone by firing striking air traffic controllers. But before we address that, let’s look at overall crime data, the context for his pronouncements. The chart below shows FBI statistics on reported violent crime during the past 25 years. Violent crime peaked in 1992 and fell steadily until 2014, with some upward movement since that time. How about major American cities, where there is more media attention? The chart below shows murder rates in the 10 largest American cities going back to 1985. 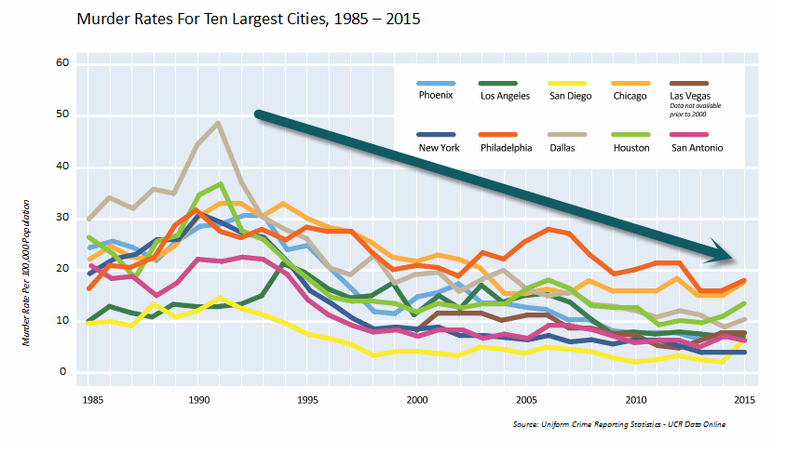 Again the trend is downward since the early 1990’s peak, with some upward movement over the past two years in a few cities. 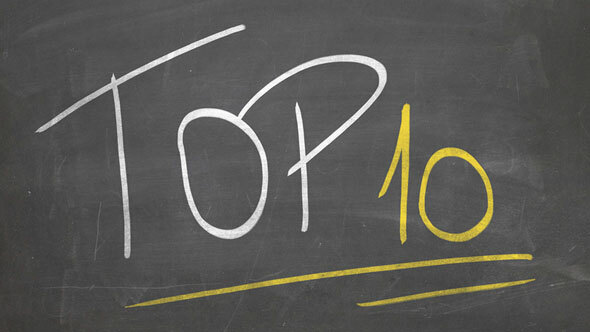 Among American cities, the largest 10 are nowhere near the highest urban crime centers. That distinction belongs to smaller cities including Milwaukee, Detroit, Oakland, Kansas City, St. Louis, Memphis, and Baltimore. St. Louis, Baltimore, and Detroit are among the 50 most violent cities in the world with numbers that rival drug cartel and gang centers in Mexico, Brazil, and Honduras. I have spent almost a decade trying to understand something that most people think doesn’t exist. My research and wild stories are shared fully in my new book, “The 2 AM Principle: Discover the Science of Adventure,” which argues that adventures aren’t random. In fact, they are a process, and these six secrets will help you create your own and live a happier life. In other words, if you have an obese friend, your chances of obesity increase by 45%, your friends’ chances increase by 25%, your friends’ friends’ by 10%, and your friends’ friends’ friends’ by 5%. If you want to live an exciting and remarkable life, select your friends based on the values that you admire. If something scares you but it won’t kill you, then do it. Instead of shying away from opportunities that put you out of your comfort zone, say yes. If you want to approach an attractive stranger, then strike up a conversation. If you think that bungee jumping looks fun but have always been nervous to try it yourself, take the leap. One year, I went to the most famous events in the world each month. No matter where it was, without knowing how to pay for it. Another year, I went to all seven continents. I went with Expedition Trips to Antarctica, and it was the most memorable experience of my life. If I didn’t set audacious goals, I’d never have to grow in order to achieve them. Traditional thinking challenges us to ask: Is the result worth the effort? Is the juice worth the squeeze? But when it comes to adventurous living, the result of the experience and the stories we have are secondary. The true gift is who we become in the process. Because long after the experience and the memories fade, we’ll still have the capacity to grow and expand our comfort zones. Staying within your comfort zone may make you feel safe, but it won’t help you succeed. It won’t push you to grow, and it won’t lead to an adventure. Living an exciting and remarkable life happens at the edge of your comfort zone. You can’t grow without crossing that threshold. When you push boundaries, you come through the experience a different person than you were at the beginning. The gift of an adventure isn’t just the great memories and stories; it is the person that you become as a result. Research has proven that we don’t remember how long we enjoyed an experience. What we remember are the peaks of the experience and the end of the experience. Psychologist Daniel Kahneman dubbed it the peak-end theory. It explains why an otherwise enjoyable date will be remembered as a miserable one if in the last few seconds, your date sticks you with the bill, says something inconsiderate, or commits another hard-to-redeem offense. When having a fun night out, people often want to extend it, hoping that it will get even better. However, it generally turns out deteriorating into something unremarkable. Many times, having an ending that spoils the whole experience makes you less willing to participate in the future. The key to remembering experiences positively is to end on a good note, which may mean ending it early. For more science-backed tips to live an exciting and fulfilling life and outrageous stories, pick up a copy of The 2 AM Principle: Discover the Science of Adventure, on sale now.